Thoughtful gifts to kick start the New Year ! The countdown has begun! If it hasn’t struck you already, New Year fever is catching on. Start the New Year on a great note! New Year comes with loads of New Year resolutions, new dreams to fulfill and lots more. 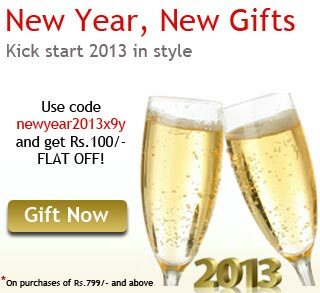 A new beginning of the year is incomplete without sending gifts to your loved ones. New Year is incomplete without New Year cards. Some of the most common New Year gifts include New Year diaries, New Year calendars, good luck articles and symbols, wax candles, sweets, flowers, bar accessories, crockery and many more. Wish your family and friends with a unique selection of gift articles that will put a sparkle in their step in the coming year. Encourage them to do more of what they love in the coming year. There’s something for everyone in this collection. ← Instant gifts for a instant Christmas surprise !